Eric's first camera...blah, blah. No, I'm not going to tell you about my first camera or about how long I've been photographing for. I'm pretty sure if you're reading this you want to know more than that. I grew up in Western Montana and the Outdoors has always been a large part of my life. My first memory of wanting to use a camera was a result spending time in places beyond roads and highways. I wanted to show and share with others what was in our backyard. I moved to Utah to pursue a degree in Meteorology, as I am, and always have been, a weather lover. I was the kid with a cloud chart poster on my wall and even had a weather radio I'd listen to at night, every night. I knew nothing about Utah except people skied there and the U of U offered Meteorology. Sweet, let's go. I immediately purchased a map of Utah and began exploring as often as I could. From the mountains to the desert, everywhere I went the landscape was different. This one state had a landscape that called to me in a way I never expected. Life changed a bit and I moved to Seattle where huge mountains, wild coastlines and intense weather all called to me once again. At some point in my 6 years in Seattle, I began seeing the landscape differently. I started seeing and experiencing expressions in Nature while simultaneously experimenting with color slide film. I was working a "real job" so my time for photography was limited to days off and an occasional vacation. Fast forward a little and my "real job" allowed me to move back to Utah again, where I could surround myself with Nature on a daily basis instead of only the weekends. I vividly recall the day everything changed for me. I was hiking in the Wasatch Mountains near Park City on a beautiful fall morning after the rain. Fog was swirling through the colored aspens as if I was walking through a painting. I checked my phone and it was time for me to go to work. I remember thinking, "Why am I leaving something I love, to go do something I don't love? This has to change." It did. For the next several years, I immersed myself into photography. After this intensive period of learning, I began working for a photographer who's work changed the way I view the world, for the better. I managed his gallery in Park City and saw first hand the power of photography and how it can enhance people's lives. I learned more in those 3 years than any other period in my photographic journey to date. A sincere thank you to Mr. Mangelsen, who's work opened my eyes. My journey continues and Utah, once again, has expanded my horizon. In early 2019, I started my own business, aptly named Horizon Photo Tours, and moved to Southern Utah. 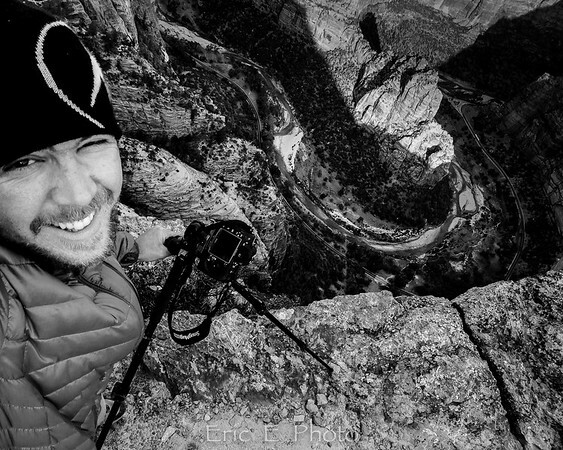 My goal is simple: to use the power of photography to show people, in person, why Southern Utah is so special. Naturally, I'm beginning this journey in Zion National Park with other locations coming soon.